#LBBExperiences: Hosting Fun-Filled Brunch At This New Party Spot in Indiranagar. Join us! A new year demands new experiences and we will make sure it’s a jolly good time for you. We’ve decided to have a trivia brunch at our new favourite spot in one of Bangalore’s busiest locality. 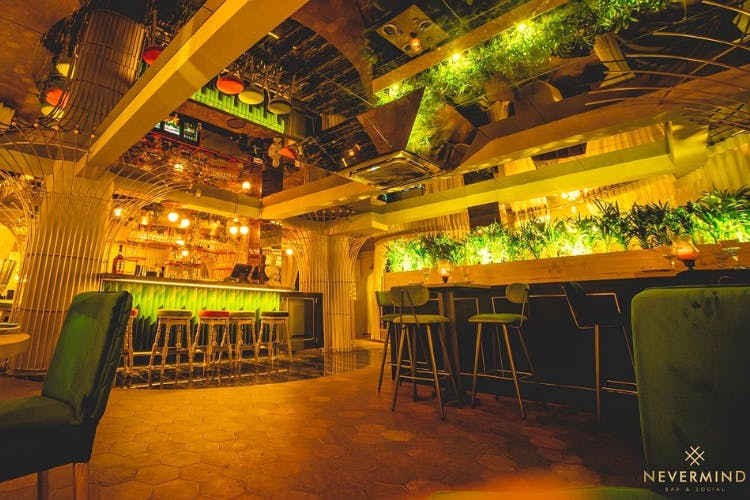 This latest chill spot in Indiranagar will be hosting us and serving global dishes and epic cocktails. Nevermind is designed to give you an escape from the daily hustle bustle of exhaustive workweeks, and party during the weekends! Got no place to go? Never mind, you got Nevermind. All you party people, this one’s for you. It’s also for those of you who escape to Bali or Krabi as much as possible, but this time, the escape is in Bangalore! Love to chill and hang out? Don’t miss this, y’all! Oh, and by the way, drinks on us! Because we will be hosting brunch with a trivia game and there will be a curated menu of food and drinks to pick from. Let go of all your woes this one afternoon, don’t think too much just show up, and enjoy. Also, it’s been a long time we met, so let’s catch up! Yes! If you find yourself in Indiranagar during lunch, head over to Nevermind without a second thought. They are introducing their all-new lunch menu that includes sumptuous starters like Baked Asian Chicken Wings with cherry and hoisin glaze, Hed Phad Medmamuang, a Vietnamese mushroom and cashew based dish; they are also serving juicy Finger Licking Butter Chicken with Crispy Naan and veg slider amongst other dishes. What we also love here is, you get to eat in this spectacular ambience and get a great value for money! Their lunches are priced between Rs 600 - Rs 700. Go on, get you lunch on at Nevermind.